An alternative method is proposed to calculate the mass defects of several light atomic nuclei and to compare those of Iron and Uranium. The calculated energies of formation of these light element nuclei are in agreement with the experimental values at the 10-2 level and that of Iron is superior to that of Uranium. An alternative method is proposed to calculate the mass defects of several light atomic nuclei and to compare those of Iron and Uranium. It is based on a new value of the proton radius, from an empiric relationship, and on the hypothesis of a toric structure of the electron. The atomic nucleus would be an aggregate of A protons in a quasi hollow sphere, when their number is high, surrounded by (A-Z) electrons, turning around them, in contact and equilibrium with them (the electric force being equal and opposed to the centrifugal force). The atomic nuclei would be formed by bringing together protons and electrons, from infinite to mutual contacts. The calculated energies of formation (mass defects) of these light element nuclei are in agreement with the experimental values at the 10-2 level. The mass defect is smaller for 3He than for Tritium as the value per nucleon for 238U compared to that for 56Fe and their ratio agrees with the measured value.No neutron would be implicated in this model. 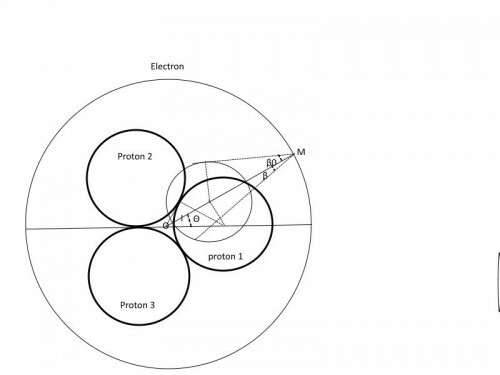 However, one could imagin that in the nuclei formed by this process, (A-Z) electrons would combine with the same number of protons to form neutrons, but this operation would loose a part of the mass defect. Atom nuclei; protons and electrons; mass defects; comparison with experimental values.